NS20E – NS45E Energy Storage Amplifiers are under development for use with modern military LFA sonar projectors. The standard frequency range is 800 Hz to 5 KHz. Lower and higher ranges can be configured as options. Optional ranges include seismic frequencies to high frequency sonars. The amplifiers can be used for other high power applications. Amplifier modules are a 5 kW H bridge with silicon carbide FETs, and can handle both inductive and capacitive reactive loads. The amplifier modules are paired with switch mode power supplies and an output transformer, which forms the building block for the modular family of amplifiers. A super capacitor-based energy storage module allows full power pulse outputs with ship power inputs reduced by up to 75%. The overall efficiency is 85% or better, resulting in low cooling requirements. Air cooling is standard and water cooling is an option. The NS Series of LFA Energy Storage Amplifiers supports output configurations from one output per module, to any combination of modules up to a single high power output. An NS45E has 9 modules and delivers 45 kW output, while the NS20E has two module sets and delivers 20 kW output. 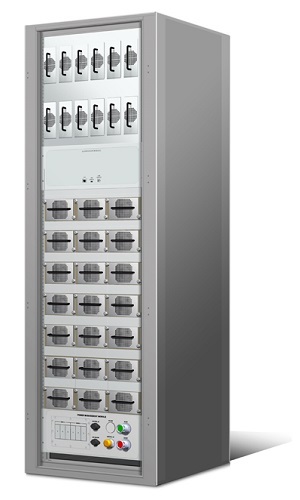 Multiple racks can be ganged together for larger power requirements. Nautel amplifiers are typically 50% lighter and 40% less volume than other amplifiers, and meet or exceed MIL STD typical warship environmental testing for shock, vibration, power supply filtering and EMI. The NS20E – NS45E amplifiers fit into a single standard rack. NS20E – NS40E amplifiers are subject to export control.